When it comes to wedding shoes, you don’t have to sacrifice comfort for style. WITHOUT a doubt, bridal shoes often play second fiddle to the gown. Unless it’s a beach wedding, a bride cannot simply go barefoot and needs to slip on something stylish for her big day. Many women often choose a pair as an after-thought, but selecting suitable shoes go a long way to keep both feet and bride happy throughout the day. Strappy heels with Swarovski crystals by Valerie Fan Wedding Gallery. There are various factors to consider when getting the perfect pair, such as comfort, design and the height of the heel. Most women would not want to tower over their husbands-to-be, hence tall women may opt for low heels or flats. However, there is nothing to stop these women from wearing elegant 10cm heels if the man she is marrying is a confident one. The shoe design also needs to complement, and not overshadow, the gown. An elaborate gown goes well with a simple pair of shoes. Gone are the days when one’s footwear and gown are made from the same material. Comfort is of prime importance, although some women are willing to forgo that for vanity. All brides would want to look stunning from head to toe and enjoy their ceremony, minus the agony of having blisters at the end of the day. Pearly white: Wedding gown and bridal shoe designer Valerie Fan, holding one of her favourite designs at her boutique Valerie Fan Wedding Gallery. Therefore, it’s crucial to get a comfortable pair of shoes and to break them in before the wedding. A few brides in the Philippines have been known to ditch tradition and wear FitFlop sandals at their garden or beach weddings. The brand, known for comfortable flip-flops that apparently yield toning and exercise benefits, has a special collection featuring glittery and floral patterns. If your curiosity is piqued, check out its Electra, Pietra, Frou or Floretta designs, which are priced from RM269 to RM399. There is also the Swarovski-crystal embellished Walkstar Rockstar limited edition priced at RM1,889. If sandals – no matter how bling bling – is just not your cup of tea, other shoe labels may appeal to your needs. For instance, Lewré Couture’s latest wedding collection offers glamorous shoes for brides and bridesmaids alike. Themed Underwater World, designs come in the form of double platform satin stilettos. There are various colours, from ocean blue, ivory oyster, coral fuschia to silver shells. Styles include slingbacks and ankle strap heels embellished with Swarovski Elements crystals in mono or multi-tones. These days, it is also a common trend to custom-make bridal shoes along with wedding gowns. The ocean blue double platform satin stiletto slingback with Swarovski Elements crystals from Lewré Couture. “Nice white or off-white shoes are difficult to find. There are brides who spend more time searching for shoes than the gown itself! “However, some brides are more fashion-forward and wear coloured shoes, which are easier to find,” shares Hoi Lai Leng, general manager of Designer Bridal Room (DBR), a designer wedding gown boutique in Kuala Lumpur. DBR currently represents nine labels such as Christian Lacroix, Annasul Y, Elie by Elie Saab, Manuel Mota, Pronovias, Reem Acra, Rosa Clara, St Patrick and Lusan Mandongus. “I’ve seen one of our brides wear red heels with her wedding gown. I’ve also seen blue (to represent) ‘something blue’. Other popular colours are gold and silver,” says Hoi. The bride who wore red heels is Shelley Wong, who got married last year. Wong, 30, had a garden wedding followed by a reception in a hotel ballroom. She wore a pair of striking red, ankle strap peep-toe stilettos with bow details. Wong bought the heels from a popular shoe store chain in Australia. “I chose red because it’s my favourite colour and I wanted something a bit quirky to go with our Alice in Wonderland theme,” says Wong, via e-mail. Wong is currently based in Perth, Australia and manages a couple of Japanese restaurants there. Not many guests noticed her shoes until they saw her wedding photographs. “A lot of people thought it was a strange choice!” she shares. Double platform satin stilettos with Swarovski Elements crystals from Lewré Couture. Indeed, white, off-white, silver and gold are still the popular colours for bridal shoes. “I don’t really suggest a strong colour contrast between the gown and the shoes,” says wedding gown and bridal shoe designer Beatrice Looi, whose boutique is in Kuala Lumpur. Looi uses materials like satin, lace, leather and PVC (polyvinyl chloride) for her footwear and enhance them with pearls, French lace, stones or beads. “For my gowns, I like to use lace but if the entire gown is lace then the shoe should have a clean look, or maybe (embellished) with some pearls,” she adds. Personally, she prefers peep-toe pumps or slingbacks as bridal footwear. “Strappy heels don’t go very well with certain gowns, unless the dress has a simple design and is shorter in front,” says Looi, whose shoe designs are priced from RM250. Wedding shoe trends have not seen much evolvement over the years, Looi observes. “I think the only changes are in the shoe shape and materials used; for example, we have better quality satin or patterned heels nowadays. “Pointed shoes are considered old-fashioned now. Two years ago, peep-toes were also a no-no but now, a little peep-toe is great, as is a ballerina shape,” adds Looi. The designer advises women to custom-make their wedding shoes because many people have uneven feet size. In addition, a number of women find it difficult to wear thin and high heels. “We usually suggest that brides wear wedges or a front platform pair if they want really high heels. A lot of women cannot balance well on 10cm heels, so adding a hidden platform in front will help,” she says. Wedding gown and shoe designer Valerie Fan shares the same thinking. “Many Malaysian women have broad feet and we usually suggest a peep-toe with a wider front for more comfort,” says Fan, whose boutique Valerie Fan Wedding Gallery is located in Petaling Jaya. “Higher heels are definitely more elegant but the height of shoes affects the bride’s posture. For my 10cm heels, I will add a front platform to make it more comfortable to wear,” she adds. Fan likes to keep her designs simple yet classic so that women can wear them again after their wedding. Many of her designs feature Swarovski crystals and materials like Duchess satin. For garden or beach weddings, she designs sandals with diamanté detailing. Her shoes start from RM259 for off-the-rack designs while custom-made ones are priced from RM359. 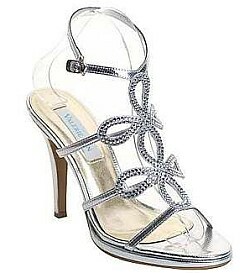 Current popular designs, says Fan, are peep-toes with either lace or Swarovski crystal embellishment. In terms of colour, she feels most brides still prefer all white or off-white colours for their gowns and shoes. “If brides have a colour theme for their wedding, some may wear blue or pink shoes with their gowns,” she concludes.